A synagogue has many roles, but its most fundamental is to be a house of worship. 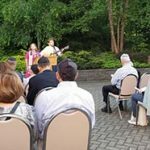 Since at least the beginning of the twentieth century, the centerpiece of Temple B’nai Abraham worship is the Friday evening service, Erev Shabbat, when we welcome Shabbat. Over the decades, as times have changed, congregational leaders have varied that service to meet the tastes, needs and desires of an evolving world and an evolving community of congregants. All Friday night services begin at 6:30 PM, but the minhag of Friday night services varies. As an extended family we enjoy a range of worship styles, especially those which lend to more congregational participation and singing. In general, the first Friday each month will be our One Family Service, shorter than the standard 45-50 minutes to accommodate the youngest among us but a “real” service nonetheless. In place of the rabbi’s remarks a story will be told. Musical accompaniment will be provided by our Shabbat Band or guitarist/song leader Toby Singer. On subsequent Friday nights musical accompaniment will be provided either by pianist Ilya Maslov or by Toby Singer, when the services will be of a more contemporary, contemplative nature, will accompany the service. Occasional services, especially at vacation time, will be a cappela and, weather permitting, summer services will be held outside. Details about a particular service can always be found on the Temple calendar. Congregants are encouraged to dress for services in a way that you find comfortable. This is not, of course, a call for jeans and T-shirts, but to achieve the warmth and welcoming feeling we all desire, by all means don’t feel you need to dress up…just show up! SUMMER SERVICES:All begin same times as services during the year. Throughout the year, preschoolers and their parents are encouraged to join us for a lively Tot Shabbat service. Led by our rabbi and cantor, we welcome Shabbat with singing, clapping, stories and celebration! Tot Shabbat is followed by a pizza dinner with either a craft project, or Shabbat/holiday story or event. Prayers, Songs, Stories and Lots of Fun! All Services are on Fridays @ 5:45 PM and include a pizza dinner. Sign in DOWNSTAIRS for Junior Congregation service attendance credit. Sign in UPSTAIRS (next to ladies’ rest room) for credit when attending regular Shabbat services. Junior Congregation meets once a month and is designed to help your children become comfortable leading the service here at TBA. We ask each family to do their best to have the children attend 8 services during the year.They can include:Junior Congregation, Holidays (sorry- Rosh Hashanah & Yom Kippur do not count toward services attended ! ), Sunday Morning Men’s Club Minyan, and Friday night or Saturday Shabbat services.Please make sure that your child signs in downstairs for Junior Congregation in the Brody Youth Lounge. If they are attending a non-Junior Congregation service, have your child sign the book located on the table outside of the ladies’ rest room.